the specialized structure of the face that serves both as the organ of smell and as a means of bringing air into the lungs. (See also Plates.) Air breathed in through the nose is warmed, filtered, and humidified; that breathed through the mouth is not. The nostrils, which form the external entrance of the nose, lead into the two nasal cavities, which are separated from each other by the nasal septum, a partition formed of cartilage and bone. Three bony ridges project from the outer wall of each nasal cavity and partially divide the cavity into three air passages. At the back of the nose these passages lead into the pharynx. The passages also are connected by openings with the paranasal sinuses. One of the functions of the nose is to drain fluids discharged from the sinuses. The nasal cavities also have a connection with the ears by the eustachian tubes, and with the region of the eyes by the nasolacrimal ducts. The interior of the nose is lined with mucous membrane, and most of the membrane is covered with minute hairlike projections called cilia. Moving in waves these cilia sweep out from the nasal passages the nasal mucus, which may contain pollen, dust, and bacteria from the air. The mucous membrane also acts to warm and moisten the inhaled air. Disorders of the Nose. The mucous membrane of the nose is subject to inflammation; any such inflammation is called rhinitis, which may be caused by the common cold, or by an allergy, particularly hay fever. Nasal polyps may obstruct the nasal passages. Epistaxis, or nosebleed, may be caused by an injury to the nose or may be a symptom of other diseases. The nasal septum may grow irregularly or be deflected to one side by injury; this condition is called deviated septum. Surgery of the Nose. Nasal surgery is indicated in disorders of the nasal septum, polyps and other growths, and traumatic injury to the structures that interfere with normal nasal breathing. Cosmetic plastic surgery is also done to correct disfigurement that is disturbing to the patient. Patient Care. Prior to surgery the patient is instructed in the kind of surgery anticipated and is informed of the immediate aftereffects of swelling and discoloration. He is told that the residual swelling may last for several weeks and success of the operation cannot be assessed until after that time. Immediately after surgery the greatest danger is hemorrhage. If the patient swallows repeatedly or spits up blood, excessive bleeding should be suspected. A Teflon splint or intranasal packing often is used to support the nasal structures and prevent the formation of hematoma, another complication that may develop. Ice compresses are applied for 24 hours after surgery to reduce swelling and minimize bleeding. The patient is placed in semi-Fowler position during this time. During convalescence the patient should avoid blowing his nose and picking at crusts. A lubricant may be used to soften the crusts, but no swabs or other objects should be used to clean the nose. A humidifier in the room may help reduce drying and irritation of the mucous membranes during healing. 1. a device placed between the endotracheal tube and the breathing apparatus to trap the heat and humidity in the exhaled gas and use it to warm and humidify subsequently inhaled gas. 2. an electronic system used to monitor and classify odors and gases, consisting of a sensor and a pattern recognition system; called also electric nose. Specialized organ at the entrance of the respiratory system that conducts, warms, humidifies, and cleans the inspired air and houses the olfactory neuroeithelium; includes both the external nose and the nasal cavities. (nōz) the specialized facial structure serving as an organ of the sense of smell and as part of the respiratory apparatus. saddle nose , swayback nose a nose with a sunken bridge. The part of the human face or the forward part of the head of other vertebrates that contains the nostrils and organs of smell and forms the beginning of the respiratory tract. the structure that protrudes from the anterior part of the face and serves as a passageway for air to and from the lungs. The nose filters the air, warming, moistening, and chemically examining it for impurities that might irritate the mucous lining of the respiratory tract. The nose also contains receptor cells for smell, and it aids the faculty of speech. It consists of an internal and an external part. The external part, which protrudes from the face, is considerably smaller than the internal part, which lies over the roof of the mouth. The hollow interior part is separated into a right and a left cavity by a septum. Each cavity is divided into the superior, middle, and inferior meati by the projection of nasal conchae. The external part of the nose is perforated by two nostrils (anterior nares), and the internal part by two posterior nares. The pairs of sinuses that drain into the nose are the frontal, maxillary, ethmoidal, and sphenoidal sinuses. Ciliated mucous membrane lines the nose, closely adhering to the periosteum. The mucous membrane is continuous with the skin through the nares and with the mucous membrane of the nasal part of the pharynx through the choanae. The mucous membrane contains the olfactory cells that form the olfactory nerve that enters the cranium. Anatomy The double-barrelled structure at the center of the face, which is a conduit of air for non-mouth breathers, and a support for eyeglasses. See Cocaine nose, Internal nose, Potato nose, Rabbit nose, Saddle nose, Sculptured nose, Stinky nose, Tapir nose, WC Fields nose Drug slang A regionally popular street term for cocaine. 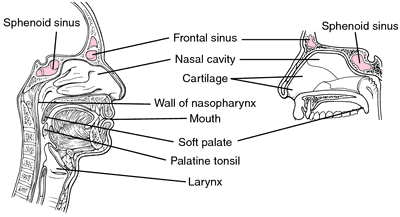 That portion of the respiratory pathway above the hard palate; includes both the external nose and the nasal cavity. A term used both for the externally visible part and for the internal nasal air passages. The nose is the normal entry route for inspired air, which is warmed, moistened and cleaned. Chemical particles in the air stimulate the nerve endings of the olfactory nerves in the roof of the nasal cavity, giving rise to the sensation of smell. the projecting part of the head of higher vertebrates that usually carries the nostrils and is associated with the sense of smell. n an organ of the body that extends from the end of the palate to the face. Olfactory cells within the nose are responsible for detecting molecules and sending the sensory impulses along the olfactory nerve to the brain. Specialized organ at entrance of respiratory system that conducts, warms, humidifies, and cleans inspired air and houses olfactory neuroepithelium; includes both external nose and nasal cavities. n the structure that protrudes from the anterior portion of the midface and serves as a passageway for air to and from the lungs. The nose filters, warms, and moistens the air on its passage into the lungs. The nose contains the end organs of smell. n paired facial bones that together shape the nasal bridge, the edges of which join with the frontal bone at the top and the upper cheek bones at the sides. the specialized structure of the head that serves both as the organ of smell and as the first segment of the respiratory apparatus. Air breathed in through the nose is warmed, humidified and filtered by the richly vascular mucous membrane. On breathing out through the nose some of the heat gained is returned to the nasal mucous membrane. See also nasal. in dogs, a partially unpigmented nose. a scissor-like instrument with the blades curved towards each other and fitted with a knob on each of their ends. The tool is inserted into the nostrils with the blades opened, positioned on either side of the septum, then closed tight. The end of the nasal septum is grasped between the ends of the tongs. Provides fair restraint for a cow having a minor interference, such as an intravenous injection. Comparable in effect to a twitch on a horse. Speleognathus australis; occurs in wild ruminants and may cause bouts of sneezing. See also nasal acariasis. unilateral or bilateral dryness, hyperkeratosis and sometimes loss of pigmentation of the nasal planum in dogs. There may be fissuring and ulceration of the nares and nasal philtrum. These are the result of damage, either inflammatory or neurogenic, to the glands responsible for lubricating the nasal planum and nasal vestibule. a vice in quail kept in overcrowded conditions. The birds pick at the soft tissue where the beak and skin join. Causes blood loss and subsequent beak deformity. 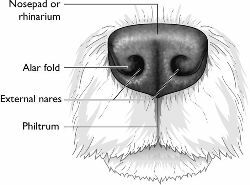 epidermal contours in the skin of the nose of dogs and the muzzle of ruminants are reflections of dermal structures; they are individually distinctive and can be replicated by applying ink to the part with an inking pad and imprinting on paper; provide a means of identification similar to fingerprints in humans. See also transponder, nasal areae. Q. Regarding Seasonal Nasal allergy. My father is suffering from seasonal nasal allergies. He took a 24-hour loratadine pill, 5 hours ago. His nose is still running just like it was. Can I take a benedryl, or is it dangerous to mix loratadine and benedryl? What else can I do to stop my nose? A. except well known drug interactions- most Dr. check it out with a computer program they have. you need to ask a Dr. or a pharmacist about it. but i can tell you that if you wait 4 times the T1/2 - that is enough to consider the drug out of the system. Q. When seasons change , a lot of people suffer of runny nose and other common allergy symptoms , why is it always like that when seasons change ? A. Seasonal changes tend to cause a lot of allergic reactions, and that is a known fact with no known mechanism. It is thought that perhaps the more atopic (bound to have allergies) people are, and with an atopic family histroy, they will develope more allergies during seasonal changes. One theory is that the environmental allergens, such as flower seeds or particles, tend to be in a higher shift and so they are more "in the air". Others believe it has to do with viral infections. Q. When you get sick (runny nose, cold, cough) do you still workout? A. Hmm, depending on how sick I am, I will usually just workout anyway. I feel it mentally helps me. Turn of River Fire Department, Inc.